We would first like to express our utmost thanks to all of you who attended the symposium. We welcomed 134 individuals from 23 countries, and the meeting was a great success. On behalf of all of us from the Local Organizing Committee, thank you. Moving forward, we have two announcements to make. 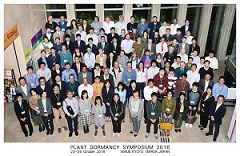 We are delighted to announce that the 7th Plant Dormancy Symposium will be held in Perth, Western Australia, in 2022. It will be hosted by Dr. Michael Considine, University of Western Australia. Once again thank you for your support, and we look forward to seeing you at the next symposium. The group photo is available to be downloaded. Please enter the password that was notified by the organizer. Plant dormancy, with all its complexities, is gradually being teased apart by recent advances in the molecular, physiological and morphological aspects of its biology. This symposium, the sixth in a series - following those in Oregon, USA, 1995; France, 1999; The Netherlands, 2004; Fargo, USA, 2009 and Auckland, New Zealand, 2013 - is an excellent opportunity to bring together international experts and emerging scientists with an interest in this exciting field of plant biology. 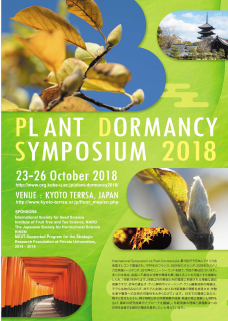 The overall goal of this symposium is to provide a forum for the exchange of information and ideas on dormancy in plants and the development of new scientific collaborations. it will encompass the latest findings in the mechanisms of plant dormancy in vegetative buds, seeds and other meristems from a variety of experimental plant systems ranging from agronomic, horticultural and tree crops to model plants. The host city, Kyoto, is the ancient capital of Japan and is recognized worldwide as the country’s historical, cultural and spiritual heart. The city offers you numerous cultural and unique experiences with its countless shrines, temples, and architectural masterpieces including 17 UNESCO World Cultural Heritage Sites. End of October is one of the best season to visit Kyoto. You can enjoy the streets and local sightseeing spots before and after attending the conference. 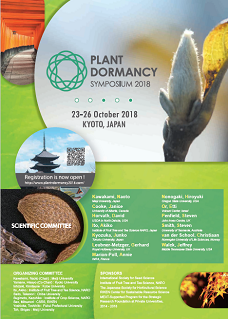 We look forward to welcoming you in Kyoto, October 2018! The deadline of abstract submission for poster presentation is 15th 31st August. 10/03/2018	Tentative time table has been updated!! 08/18/2018	Deadline of late registration has been extended until 31th August! 08/16/2018	Deadline of abstract submission for poster presentation has been extended until 31th August!